Access patient information, at any time, from any location, on any device, and know your data is secure. Physicians and healthcare providers need to use mobile devices to communicate with patients and share data effectively within the patient care continuum. Keeping that data secure has never been more important or more difficult. Meeting HiPAA compliance in a world with over 165,000 health apps, a growing number of cyber threats, and hackers around every corner is more than just challenging. Secure.Systems is a containerized mobile workspace solution delivered from the cloud that creates a more secure, protected environment for healthcare data and applications. It separates, encrypts and protects the enterprise data from hackers. It keeps personal apps separate from hospital apps with separate rules for behavior and protects each from contamination. BYOD or COPE—we’ve got you covered. HiPAA-Ready Security protected through a defense-grade, FIPS 140-2 compliant, AES 256-bit encrypted app container designed to secure data and apps without hindering functionality. Integrates Seamlessly with current EMM tools as an added layer of mobile security. More Functionality with secured productivity apps that allow employees to manage files, communicate, browse the internet, and use location-based services. Easy to deploy and manage while giving IT full control and visibility. SyncDog is the leading ISV for building mobile frameworks that extend app functionality to devices while securing corporate and Government networks from a mobile-endpoint threat. 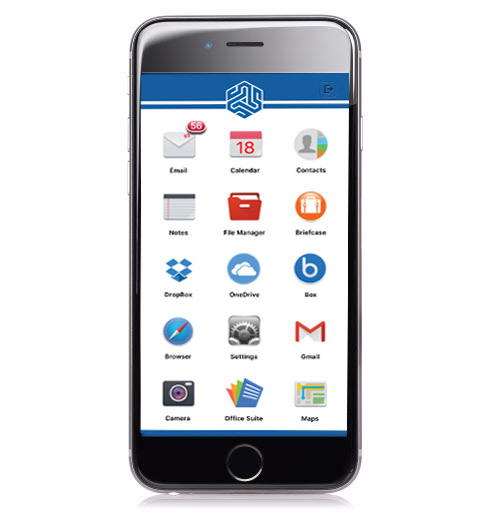 SyncDog’s flagship solution, Secure.Systems™, delivers a rich and unimpeded mobile experience for employees working remotely, and supports a multitude of enterprise collaboration apps within a NIST-certified, FIPS 140-2 encrypted container application.